The 18th Annual Southern Writers/Southern Writing Conference, a University of Mississippi graduate student event held in conjunction with the university’s Annual Faulkner and Yoknapatawpha Conference, will take place July 12-14, 2012. In addition to critical abstracts exploring Southern literature and writers, conference directors invite creative writers CURRENTLY ENROLLED IN GRADUATE PROGRAMS to submit poetry, short stories, or novel excerpts that deal with Southern themes or settings. Accepted creative entries will be featured on several panels. There will also be a nighttime reading and reception at Off-Square Books in downtown Oxford. The conference reading limit is 15 minutes. Please send entire creative works to <swswgradconference(at)gmail.com> (replace (at) with @). Please send your submissions as Word attachments and include your university affiliation, mailing address, and e-mail address. The deadline for submissions is 5:00pm on Monday, April 2nd, 2012. ThrillerFest, an annual four-day celebration of thriller books, the authors who write them, and the fans who read them, will take place July 11-14, 2012 at the Grand Hyatt Hotel located in Midtown Manhattan. This is where you’ll find CraftFest and AgentFest, two great opportunities for emerging thriller writers. AgentFest is designed to put authors and agents together for the purpose of pitching projects. The event is set up like speed-dating: you pitch your novel to an agent for a few minutes, get the agent’s reaction, and then move on to a different agent. The 2012 event has confirmed over 50 top-level agents and editors, each searching for the next bestselling author. That could be you! Time to buckle down, finish your manuscript, polish your prose, and prepare for this annual event. Last year, eight attendees signed with their dream agent. For a list of participating agents, as well as what they are looking for and their current client lists, please visit http://www.thrillerfest.com/agentfest/participating-agents/. 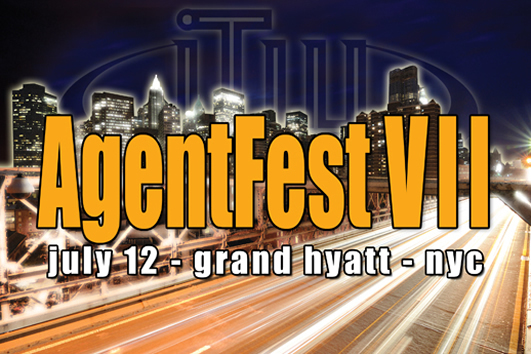 If you wish to attend AgentFest, you must also register for CraftFest. For registration information, go to http://www.thrillerfest.com/registration/.